Summary: A murder… . . . a tragic accident… . . . or just parents behaving badly? What’s indisputable is that someone is dead. But who did what? 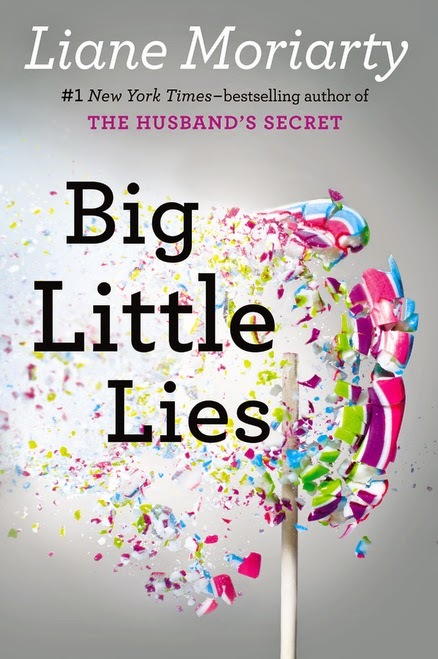 At this year's BEA, I was fortunate enough to receive an advance copy of Liane Moriarty's latest novel BIG LITTLE LIES. I was not only excited to get my hands on a copy of this novel because I'm a huge fan, but I also met Ms. Moriarty (albeit for less than minute!) and had the book signed. Little did I know just how lucky I was! This book is wonderful -- from the cover art which is perfect to the interesting characters to the intriguing story!!! At its simplest, BIG LITTLE LIES is about three moms who become friends when their children are in the same kindergarten class. (I think all moms can relate to this part of the novel!) However, the story becomes more serious as details are revealed about each of these women's lives. They are all facing challenging times and choose to keep their problems secret from each other. Madeline was probably my favorite because she reminded me of women I know. She's a piece of work and highly entertaining -- I'd love to have her as a friend! She is married to her second husband Ed and has two kids with him; however, she also has a teenage daughter from her first marriage. In normal circumstances, teenage girls and their moms can find themselves at odds with each other; however, it's even more complex when the ex and his wife live in the same small town and have a daughter in school with Madeline's youngest... and the teenager wants to live with them! Then there is Celeste. On the outside, Celeste has it all -- she's beautiful with twin boys and a successful husband. However, Celeste has a major secret that she's been keeping for years. Her husband goes back and forth from being "perfect" to physically abusing her. She wavers between wanting to leave him and wanting to stay because she loves him. Finally, there is Jane, a single mom of Ziggy who has just moved to the small town and doesn't really fit in with the other moms. When a classmate accuses Ziggy of bullying her, Jane has her own doubts. At first, she doesn't believe her precious son could harm anyone, but she soon wonders if he takes after his cruel father. As the "Blond Bobs" try to have Ziggy removed from the school with a petition, Jane discovers just how mean women can be to each other. I absolutely devoured BIG LITTLE LIES. It was a fantastic book for so many reasons. I'm absolutely certain I can't cover everything I loved about this book, but I can mention few. It's one of those novels where everything just came together and worked. One of the best things about this novel was how it was presented. The book began with a mystery -- there is a lot of chaos and shouting at the local elementary school fundraiser and someone is found dead. It immediately goes back six months in time (to the beginning of the school year) and builds tension as the the fundraiser approaches. It goes back and forth between the three women and their stories, but it also has snippets/quotations from the murder investigation from other minor characters in the novel. The mystery is revealed near the end of the novel as well as a few other shocking things! Another really good thing about this novel were the characters. I absolutely loved Madeline, Celeste, and Jane; and I truly cared about each one of them. I became vested in their stories from the get-go, and I found myself both laughing and crying with them. It might surprise you that I mentioned laughing because this book deals with some very serious issues; however, the author managed to make these women and their relationships so real. She also incorporated quite a bit of humor into the story, especially Madeline's. Finally, I loved the way the book made me feel. I am a sucker for novels that celebrate women's friendships but BIG LITTLE LIES went to the next level. By taking on such serious issues like bullying and abuse, I felt as if this book made me think about what my friends are dealing with... their secrets. I was especially impressed with how the author explored abuse and I thought Celeste's thoughts on the matter were both surprising and insightful. However, I was equally impressed with the portrayal of school moms. I am entering my 10th straight year as an elementary school mom, and I had to laugh (and cringe) at how realistic the portrayal of these women was. It shouldn't come as any surprise that BIG LITTLE LIES is perfect for book clubs. There is a reading guide with thirteen thought-provoking questions. Some of the themes you might want to explore are friendship, marriage, divorce, parenting, bullying, abuse, secrets, peer pressure, second chances, forgiveness, and lies. I am predicting that this novel will be HUGE with female book clubs over the next year or so! Overall, BIG LITTLE LIES is a terrific, not-to-be-missed novel. Highly recommended! I also loved this one! I reviewed it last week here! Wow! It sounds like I need to move this one up my reading stack! This book was so darned good. Moriarty does that...she just NAILS it when it comes to women and motherhood and friendships. She always makes me take a step back and analyze myself as well. I am completely guilty of warning my kids away from the bullies and the kids who draw trouble. My God the bad behavior that school moms are guilty of. The author always takes it to a much more serious level though, and that is why her books go way beyond chick lit. I have an upcoming plane trip ... this sounds like the book to take with me!